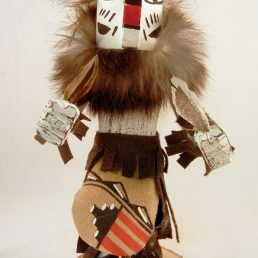 Some kachina dolls arise from the history of one of three mesas that make up the Hopi Reservation, while other kachina dolls and their stories are common among all mesas. 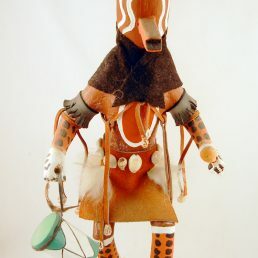 Over time, kachina doll stories from one mesa may be conflated or confused with those of another mesa. Because kachina doll stories and history are not recorded in writing, sometimes it’s impossible to know the “real” origin of a particular kachina figure. Angwushahai-i, Crow Bride, is believed by some Hopi to be Angwusnasomtaka, Crow Mother, goddess of the kachinas. Some Hopi believe that Crow Bride is Crow Mother in disguise. Both figures are recognizable by dark feathered wings on the side of her head, but Crow Bride is distinguished by her white dress. Angwusnasomtaka is common to all three Hopi mesas and is a revered figure. She brings the yucca blades used for the children’s initiation rites to the kiva. However, it is believed that Angwushahai-i (Crow Bride) is the one who initiates children, speaking to the whippers; Crow Mother does not speak. Hemis may be borrowed from the Jemez Pueblo. These kachinas are the only dancers in the Niman ceremony during which the first corn harvest of the year is distributed to the audience in the plaza. The Hemis are recognized by their beautiful stepped headdresses adorned with feathers. 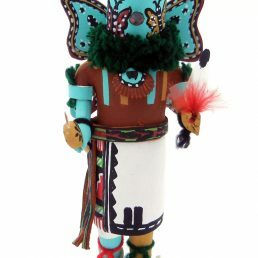 Bear Kachina is very powerful, believed by many to be able to cure the sick. 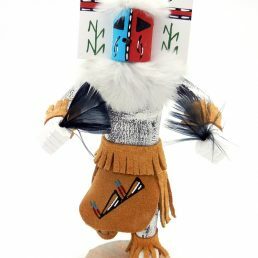 Bear Kachina may don many colors—white, blue or yellow—during different festivals and dances but can always be recognized by the bear footprints on one or both of its cheeks. 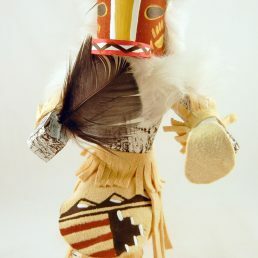 Eagle Kachina may be a Zuni figure imported into the Hopi culture. Eagle Kachina on Third Mesa is usually all back and with a different headdress than the Kachina on First Mesa. Second Mesa Kwahu typically has a yellow and red body. Red-tailed Hawk is one of the Chief Kachinas of Second Mesa. Like Nakiachop, Palakwayo’s function is not entirely clear, making him absent in many Hopi villages. However, many shrines still exist, and Palakwayo is a key figure in the Pachavu at Oraibi. Soyok Wuhti, Monster Woman (sometimes called Ogre Woman), is, indeed, a terrifying figure. Dressed in all black with straggly hair that frames a fanged mouth, she carries a blood-smeared knife in one hand, a long crook in the other. This kachina seems to terrify children, often providing a teaching tool for parents of misbehaving youngsters. Sun Kachina (or Sun Shield Kachina) represents the spirit of the Sun. He bears a spruce tree or flute in his left hand and a bell in his right. Call 800.748.1656 or send us an email. Understanding even basic kachina doll information is often difficult without an understanding of the larger context of Hopi Pueblo ceremonies and culture. 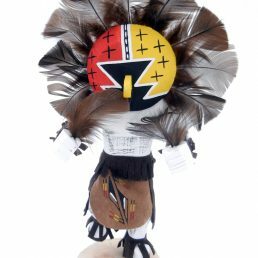 However, there are many books on kachina doll stories and history that can help you appreciate the significance of the dancers and carved wooden representations of the kachina spirits. 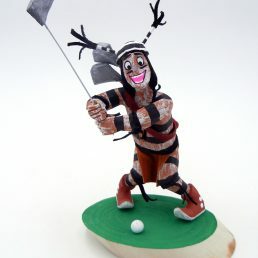 Authentic kachina dolls are not expressions of an artist’s whim. 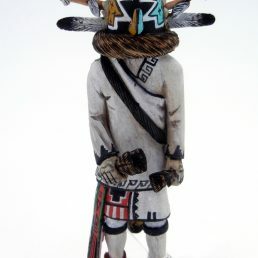 Each kachina doll has a particular history that dictates the doll’s appearance and importance to the Hopi people. 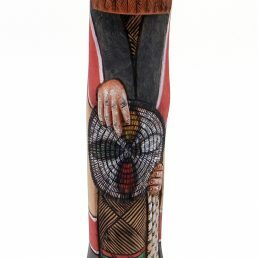 Palms Trading Company carries a large selection of authentic Native American Indian art, including Hopi and Navajo kachina dolls. 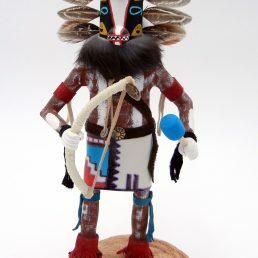 Our knowledgeable staff is happy to answer your questions about particular kachina doll figures, and our personal shopper can keep a lookout for new dolls for sale. Just contact us!